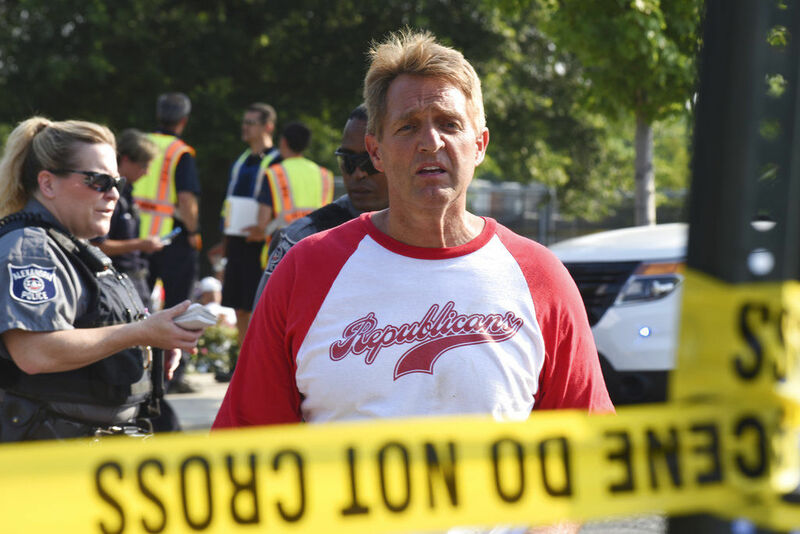 Sen. Jeff Flake, R-Ariz. walks toward media gathered at the scene of a shooting at a baseball field in Alexandria, Va., Wednesday, June 14, 2017, during a congressional baseball practice where House Majority Whip Steve Scalise of Louisiana was shot. On Wednesday morning, Washington, D.C., rightly fretted over the fate of a Republican congressman and four others felled by a gunman’s fire in suburban Alexandria, Va., as they practiced for a charity baseball game. But just a few miles away, on Capitol Hill, a Republican member of Congress from South Carolina was pushing a bill that would ease restrictions on silencers, making it easier, as The Washington Post noted, for shooters such as those involved in Wednesday’s incident to open fire without being heard. According to published reports, U.S. Rep. Jeff Duncan wants to fold his euphemistically named “Hearing Protection Act,” into a broader sportsmen’s bill. The measure, which would exempt silencers from regulation under the National Firearms Act, has attracted 148 co-sponsors and the enthusiastic backing of both the National Rifle Association and the eldest son of the president of the United States. Duncan’s bill was set to get a hearing before the House Natural Resources Subcommittee on Wednesday, but it was delayed in the wake of the shooting. Still, you can bet your bottom dollar there will be no gavel-to-gavel coverage of that bill the way there was recently for the congressional circuses involving former FBI Director James Comey and Attorney General Jeff Sessions. Allegations of Russian interference, Trumpian self-dealing, serial Tweeting, and general malfeasance and incompetence at one end of Pennsylvania Avenue are worthy of public attention, but they’re entirely obscuring what’s going on at the other end. Republicans in the House and Senate, emboldened by their majorities, are pushing through bills like Duncan’s, even as they stealthily cobble together the votes on a so-far top secret Obamacare replacement, and marshal the votes to gut financial protections for millions of Americans. This is boring, but no less important stuff — even if it doesn’t play well as the visuals of the hearings or of Cabinet secretaries expressing North Korean “Dear Leader”-like loyalty to a chief executive who often cannot be bothered to immerse himself in the tiny details of policy. Trump urged the Senate to pass a “more generous” alternative” to a House bill that would leave tens of millions without coverage and cost hundreds of thousands of jobs nationwide, The Associated Press reported. So that’s what Senate Republicans are doing behind closed doors. There have been no hearings, no debate. The details of the proposals are a closely guarded secret. And as The Washington Post reports, the back-channel process is working. Republicans have apparently put together the 50 votes they need to repeal and replace Obamacare with an alternative that, while surely odious, may be slightly more gentle than the assault on consumers that passed the House. July 4 recess. That would allow Repub-licans to pass the bill, skedaddle out of town, and then spend the rest of the summer doing their best to dodge outraged constituents at the town halls they surely won’t be holding. In the meantime, the banking industry is rejoicing in a light-speed House vote this week to repeal the law popularly known as “Dodd-Frank,” which is supposed to protect consumers in the event of another financial meltdown. As CNN Money reports, the bill sponsored by House Financial Services Committee Chairman Jeb Hensarling, R-Texas, was passed over the objections from Democrats, who argued that it would put the interests of the financial sector ahead of those of working Americans. 60 votes required for passage, The Texas Tribune reported. So it has that going for it, at least. And that’s why you don’t see Republicans clamoring — at least for now — for Trump to come clean on Russia or to untangle the birds nest that are his financial conflicts of interest, or even moderate the belligerent tone he’s taking with America’s overseas allies. Yes, it’s true that Trump might well end up being a nightmare for Republicans during next year’s midterm elections. Trump is in the White House. And he’s holding the pen that will sign all this stuff into law. And, at least for now, that’s exactly where Republicans want him.